As some of our readers have already noticed, there was a significant problem with the daily sea ice data images on February 16. The problem arose from a malfunction of the satellite sensor we use for our daily sea ice products. Upon further investigation, we discovered that starting around early January, an error known as sensor drift caused a slowly growing underestimation of Arctic sea ice extent. The underestimation reached approximately 500,000 square kilometers (193,000 square miles) by mid-February. Sensor drift, although infrequent, does occasionally occur and it is one of the things that we account for during quality control measures prior to archiving the data. See below for more details. We have removed the most recent data and are investigating alternative data sources that will provide correct results. It is not clear when we will have data back online, but we are working to resolve the issue as quickly as possible. Figure 1. Daily Arctic sea ice extent map for February 15, 2009, showed areas of open water which should have appeared as sea ice. Sea Ice Index data. About the data. Where does NSIDC get its data? NSIDC gets sea ice information by applying algorithms to data from a series of Special Sensor Microwave/Imager (SSM/I) sensors on Defense Meteorological Satellite Program (DMSP) satellites. These satellites are operated by the U.S. Department of Defense. Their primary mission is support of U.S. military operations; the data weren’t originally intended for general science use. 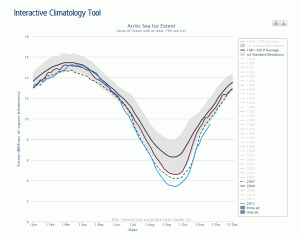 The daily updates in Arctic Sea Ice News & Analysis rely on rapid acquisition and processing of the SSM/I data. Because the acquisition and processing are done in near-real time, we publish the daily data essentially as is. The data are then archived and later subjected to very strict quality control. We perform quality control measures in coordination with scientists at the NASA Goddard Space Flight Center, which can take up to a year. High-quality archives from SSM/I, combined with data from the earlier Scanning Multi-channel Microwave Radiometer (SMMR) data stream (1979–1987) provide a consistent record of sea ice conditions now spanning 30 years. Figure 2. Daily total Arctic sea ice extent between 1 December 2008 and 12 February 2009 for Special Sensor Microwave/Imager SSM/I compared to the similar NASA Earth Observing System Advanced Microwave Scanning Radiometer (EOS AMSR-E) sensor. As discussed above, near-real-time products do not undergo the same level of quality control as the final archived products, which are used in scientific research published in peer-reviewed journals. However, the SSM/I sensors have proven themselves to be generally quite stable. Thus, it is reasonable to use the near-real-time products for displaying evolving ice conditions, with the caveat that errors may nevertheless occur. Sometimes errors are dramatic and obvious. Other errors, such as the recent sensor drift, may be subtler and not immediately apparent. We caution users of the near-real-time products that any conclusions from such data must be preliminary. We believe that the potential problems are outweighed by the scientific value of providing timely assessments of current Arctic sea ice conditions, as long as they are presented with appropriate caveats, which we try to do. For several years, we used the SSM/I sensor on the DMSP F13 satellite. Last year, F13 started showing large amounts of missing data. The sensor was almost 13 years old, and no longer provided complete daily data to allow us to track total daily sea ice extent. As a result, we switched to the DMSP F15 sensor for our near-real-time analysis. For more information on the switch, see “Note on satellite update and intercalibration,” in our June 3, 2008 post. On February 16, 2009, as emails came in from puzzled readers, it became clear that there was a significant problem—sea-ice-covered regions were showing up as open ocean. The problem stemmed from a failure of the sea ice algorithm caused by degradation of one of the DMSP F15 sensor channels. Upon further investigation, we found that data quality had begun to degrade over the month preceding the catastrophic failure. As a result, our processes underestimated total sea ice extent for the affected period. Based on comparisons with sea ice extent derived from the NASA Earth Observing System Advanced Microwave Scanning Radiometer (EOS AMSR-E) sensor, this underestimation grew from a negligible amount in early January to about 500,000 square kilometers (193,000 square miles) by mid-February (Figure 2). While dramatic, the underestimated values were not outside of expected variability until Monday, February 16. Although we believe that data prior to early January are reliable, we will conduct a full quality check in the coming days. We are actively investigating how to address the problem. Since we are not receiving good DMSP SSM/I data at the present time, we have temporarily discontinued daily updates. We will restart the data stream as soon as possible. Some people might ask why we don’t simply switch to the EOS AMSR-E sensor. AMSR-E is a newer and more accurate passive microwave sensor. However, we do not use AMSR-E data in our analysis because it is not consistent with our historical data. Thus, while AMSR-E gives us greater accuracy and more confidence on current sea ice conditions, it actually provides less accuracy on the long-term changes over the past thirty years. There is a balance between being as accurate as possible at any given moment and being as consistent as possible through long time periods. Our main scientific focus is on the long-term changes in Arctic sea ice. With that in mind, we have chosen to continue using the SSM/I sensor, which provides the longest record of Arctic sea ice extent. 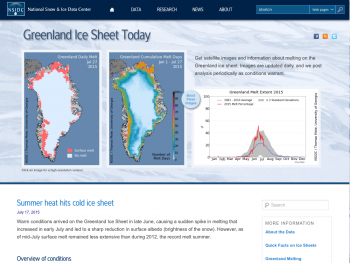 Why is the Sea Ice Index product used to study sea ice? Do your data undergo quality control?